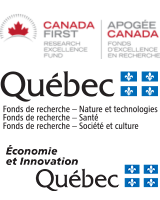 Healthy Brains for Healthy Lives/Cerveau en santé, vie en santé is a bold and ambitious initiative that unites McGill’s world-leading strengths in clinical and research neuroscience with pioneering work in neuroinformatics. Long renowned as a leader in neuroscience, McGill is setting a new global standard for computationally intensive and interdisciplinary research on the brain, made possible with an $84 million investment from the Canada First Research Excellence Fund (CFREF). Healthy Brains for Healthy Lives (HBHL) seeks to improve the lives of Canadians by advancing understanding of how the individual brain functions in health and disease, throughout our lives. Neurological disorders affect 1 in 10 Canadians of all ages. There is great urgency to identify and implement solutions that create healthier brains. Through innovative funding programs, exceptional people, and by focusing on four interconnected research themes, HBHL will transform how we view and treat the brain. Collaborating with educators and industry, HBHL will develop evidence-based programs that address the specific mental health and neurological challenges of Canadians and promote healthy living through supportive environments. Join us for a day of discovery and thoughtful exchange that will spark new ideas, collaboration and innovation, not only within McGill but across the Canadian and international neuroscience communities. McGill’s New Residence Hall, 3625 Park Ave.
HBHL's annual Research Day is designed to showcase the research of trainees (graduate students and postdoctoral fellows) who are working in areas related to HBHL's goals and priorities. Presentations will be given by HBHL Fellows as well as trainee representatives from partner institutions. All trainees, faculty and staff with an interest in brain health are encouraged to attend.